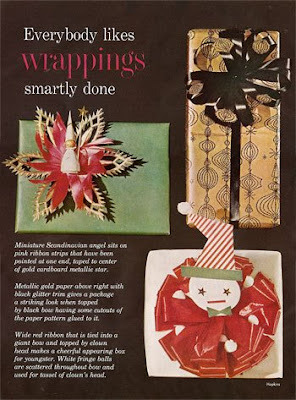 I'm always impressed when people come up with creative ways of wrapping holiday presents beyond the Santa paper and stick-on bows from the drug store. No matter what is inside, if a gift is carefully and thoughtfully wrapped, it feels like the person giving it to you really cared (and if it turns out that it contains Paulie Walnuts cologne, at least you got to enjoy it for a few minutes before you opened it). 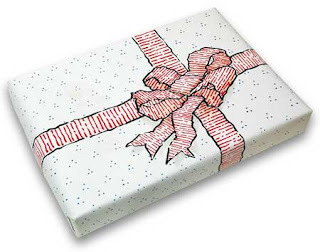 The package above was wrapped in white paper, and then a pattern and "bow" were carefully drawn on with markers- I found it on this crazy website called WrapArt that has tons of wild ideas with detailed how-tos. 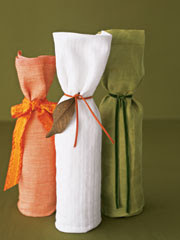 These wine bottles are wrapped in pretty linen napkins or dishcloths and tied with ribbon (photo is from Real Simple). A good way to dress up (or disguise) a re-gifted bottle from your last party. I spotted this idea on Lupin's blog, Bugs and Fishes (and then everyone else's blog, because it got widely linked to- watch me jump on the bandwagon). So clever and personalized! 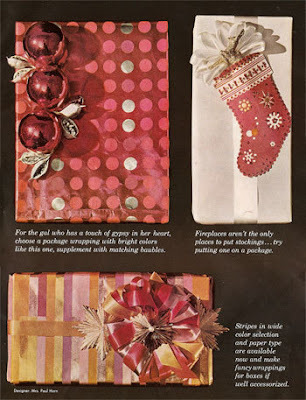 Lastly, I found these old pages from a 1960's ladies' magazine (Good Housekeeping, maybe) while zipping around the internet. I downloaded them, and then promptly and thoroughly forgot where I got them. 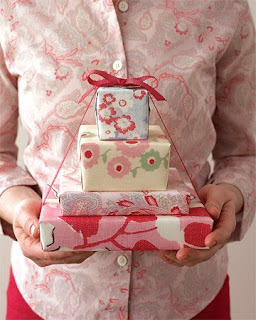 But they are full of fun, kitschy wrapping ideas, and seem to prove that, when it comes to gifts, originality has always counted. That's a wrap!